AMHERST, Ma. – Wrapping up what President Biddy Martin called a “campaign aimed at ensuring socioeconomic, racial, ethnic, and occult diversity” in Amherst’s unrecognized, yet fundamentally important fraternal organizations, the “You Did It!” planetary alignment and Fall Equinox fundraiser celebration will take place this weekend to consecrate the reincarnation of Psi Upsilon. A $500 million campaign started in 2008, the fundraiser to help bring back a fraternity abolished for “serious violations” including hazing and witchcraft will be center stage on campus this weekend. Programs include a masked ritual sacrifice of a lamb, several distinguished speakers on a diverse range of occult practices, and a telescope viewing of the Harvest Moon. Amherst Computer Science Professor Scott Kaplan, a Psi U alumnus and current chaplain to the fraternal organization predicated on devouring live human flesh, is spearheading the rituals this coming weekend. 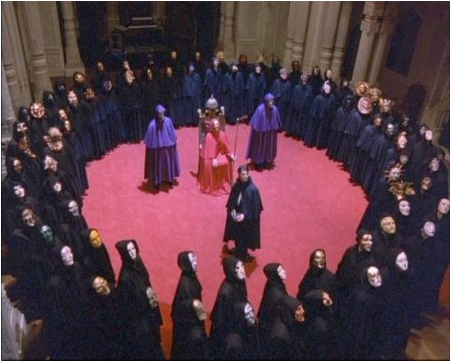 The rituals are set to begin today at 4 PM with a private initiation for new members in Leland Dormitory, followed by a massive, public ritual in Valentine Quad. Light refreshments and human flesh will be served. This entry was posted in Academia by deputymetroeditor. Bookmark the permalink.